Have you ever wanted to experience what it feels like to glide down the open face of a moving wave?! Surf lessons are conducted at a beach break with perfect waves for beginners and intermediates. 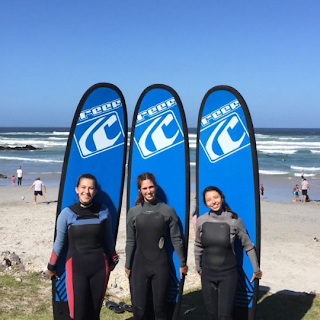 Instructors have many years of surfing experience and have helped hundreds of learners find their feet. Included is also a lesson on ocean awareness. You will be helped into the surf and onto your feet! The day starts by you being picked up by an adventure instructor at 08:00 in City Bowl Areas and taken to either Big Bay Blouberg or Muizenberg (depending on surf condition) where you will be kitted out with your wetsuit and surf board. You will then have a short warm up and a lesson on ocean awareness on the beach before heading into the surf and getting taught exactly how to paddle into a wave and stand up! After 1.5 hours of being taught to surf, you will be given the chance to surf by yourself!